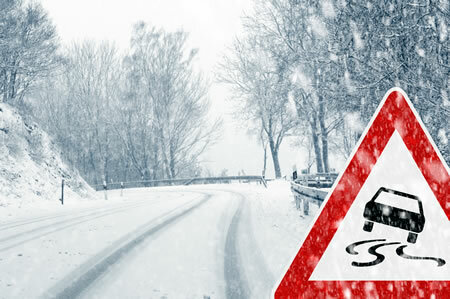 Severe winter weather conditions can pose a challenge for even the most experienced driver. When the “Big Freeze” takes hold, it’s best to avoid the roads if you can. But we all know this isn’t always possible. So, if you have to drive in snow and ice, how can you make sure you’re doing it safely? Check the weather forecast before setting off, especially if you are planning a long journey. Remember, the conditions en route and at your destination could be different from those at your starting point. The Met Office, the UK’s official weather service, issues weather warnings up to seven days ahead for rain, thunderstorms, wind, snow, lightning, ice and fog. These are widely reported in the national and local media, and shared on social media. Police forces often publish advice for drivers if the roads in their area are affected, or likely to be affected, by adverse weather conditions. Always allow more time for your journey in wintry weather. You will be driving slower than you normally would and there are likely to be delays. The Highway Code advises motorists to pack an emergency kit when heading out to drive in snow and ice. Road safety charity “Brake” recommends adding a warning triangle and high-visibility vest to your kit too. Ensure your mobile phone is fully charged, in case you need it. But, of course, you must NEVER break the law in relation to using a phone while driving. Read more about the laws that affect use of mobile devices while driving here. In short, on top of being extremely dangerous, if caught you will receive a CU80 driving conviction which most likely increase the cost of your insurance premiums. Before you set off, you must clear all snow and ice from your windows. The Highway Code states that lights and number plates must be clearly visible and legible. Make sure all mirrors and windows are free of condensation. Remove any snow from the roof of your vehicle as it could slip and obscure your vision while driving. Snow which could fall off into the path of other road users should also be cleared. If you experience wheelspin when you’re starting off in deep snow, do not rev the vehicle any more as this will cause the wheels to dig in further! Instead, put the vehicle in the highest gear you can and manoeuvre gently backwards and forwards to creep out of the rut. This is the advice from both Brake and the Driver and Vehicle Standards Agency (DVSA). Switch your headlights on if visibility is reduced – the Highway Code defines this as a situation where you cannot see for more than 100 metres. Fog lights can also be used, but should be switched off once visibility improves. Once you are on the road, take extra care and drive cautiously. Snowfall and icy patches could vary throughout your journey so always be prepared to slow down even further. Slow Down – drive at a slow speed in as high a gear as possible. Look out for temporary speed limit signs and drive particularly slowly round corners. Safe Gap – stopping distances can be 10 times greater in icy weather so drop back as much as you can to maintain a safe buffer behind the vehicle in front. Check Grip – if the steering feels unresponsive this may indicate ice and your vehicle losing its grip on the road. Find a safe place to touch the brakes to test your grip. Be Vigilant – people and hazards can be harder to spot in bad weather. Drive slowly and cautiously so you can see them in plenty of time. Keep Control – be gentle with all controls including brakes, accelerator, steering, clutch and gears. Avoid any harsh or sudden manoeuvres. Your vehicle skids – don’t brake! Take your foot off the accelerator and steer into the direction of the skid until you regain control. You get stuck – unless help is visible within about 100 metres, you should stay in your vehicle, according to Brake. So, the key things to remember about driving safely in snow and ice are: check the weather forecast before you travel, carry a winter emergency kit, prepare your vehicle thoroughly before setting off then drive slowly and cautiously once you’re on the road. And wear an extra layer. It’s freezing out there!